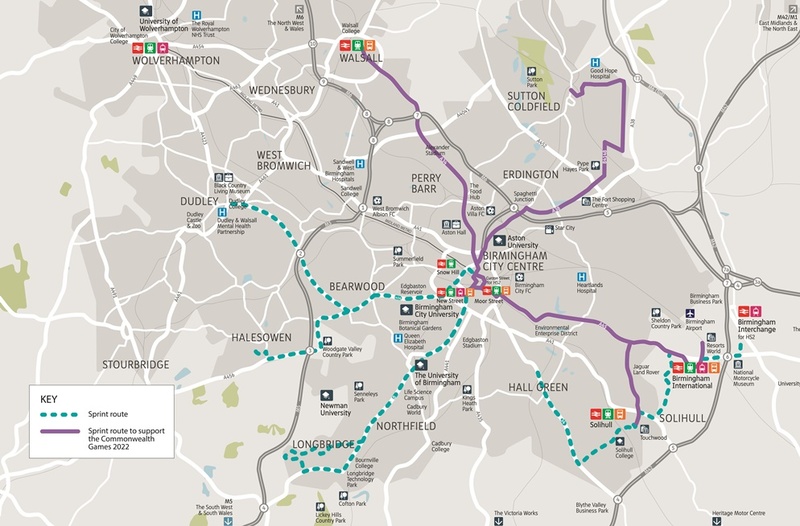 For your views on three proposed Sprint public transport routes. Consultation responses are summarised in a report, available on the Transport for West Midlands website. The feedback from the consultation will allow further refinement the design of the schemes and look at alternate solutions where appropriate. Updates on the schemes are expected in March 2019. 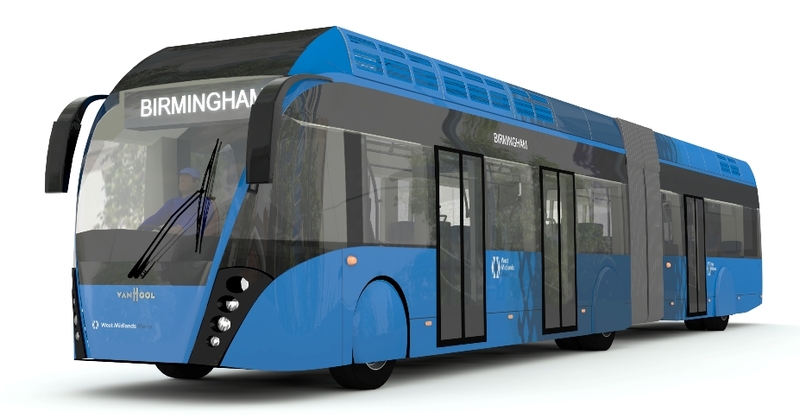 Public transport in the West Midlands is being transformed. Sprint is a brand new, modern, high quality public transport service. 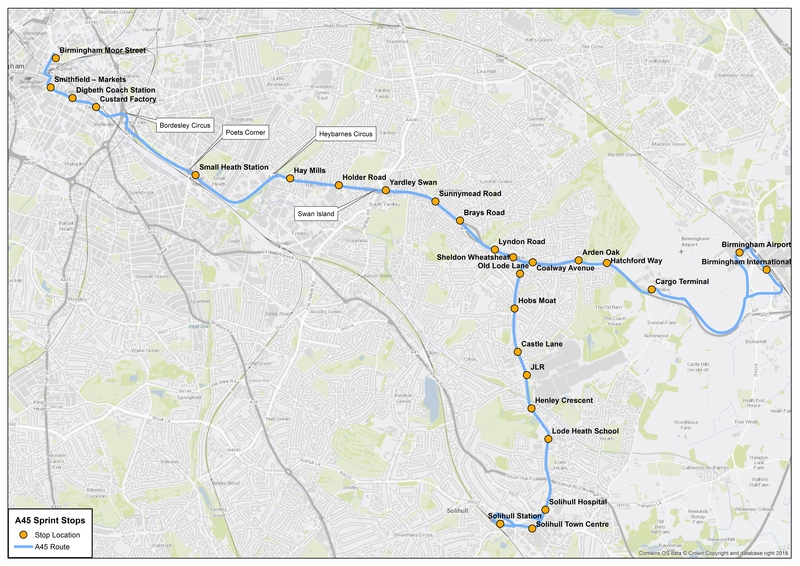 Sprint runs on the road, with dedicated bus lanes and priority through areas of congestion, which will make the journey times much more reliable. The vehicles will offer passengers a level of service and comfort similar to a tram, with off-board ticketing, multiple-door boarding, wheelchair and pushchair access, free Wi-Fi, and air conditioning as well as on-board audio visual announcements and travel information. The stops will offer a spacious and sheltered waiting environment with comfortable seating, pre-payment ticket machines to ensure efficient boarding and passenger information to help people find their way around. 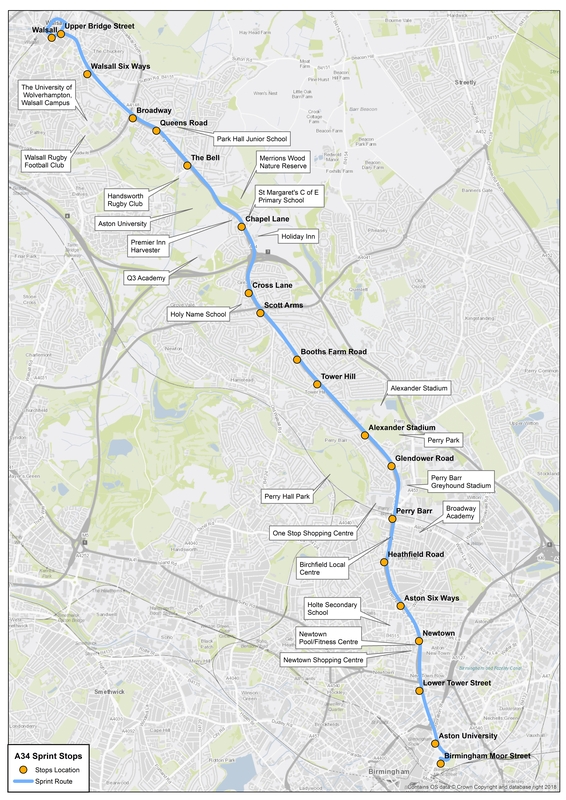 By 2026, we expect the Sprint network to be made up of seven routes, which will provide essential links to the two HS2 stations serving the region in Birmingham City Centre and Birmingham International. A34 - Walsall to Birmingham via Sandwell, with a journey time of 40 minutes or less. 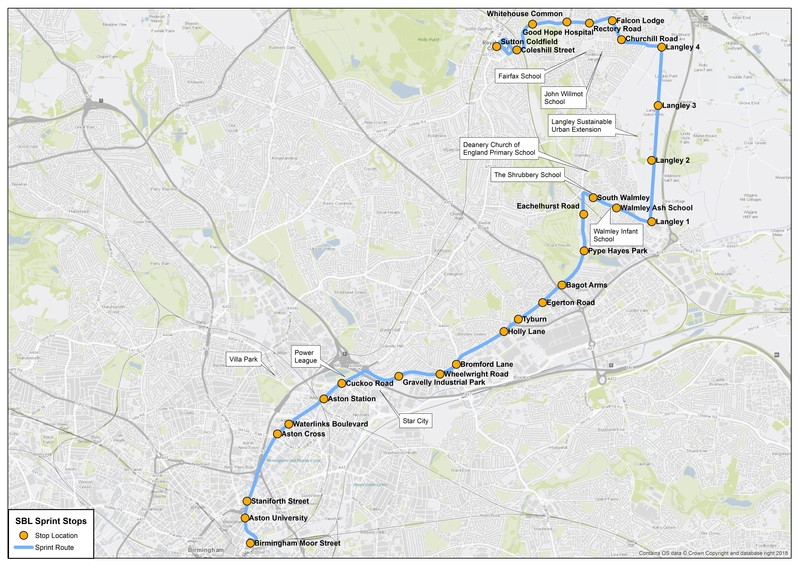 Sutton Coldfield to Birmingham via the planned new neighbourhood at Langley, with a journey time of 12 minutes or less between Sutton Coldfield and Langley, and 30 minutes or less between Langley and Birmingham. A45 - Solihull and Birmingham Airport to Birmingham, with a journey time of 45 minutes or less between Birmingham Airport and Birmingham city centre, and 45 minutes or less between Solihull and Birmingham city centre. The bus lanes and bus priority can also be used by local bus services, so all journeys using part of the route will benefit from faster journeys and better reliability. To use the maps below, click on a coloured rectangle for a short description of the changes proposed and to open the detailed map of those changes. Detailed maps will open in a new tab of your browser. Proposed Sprint stops are shown as pins (blue for Walsall, pink for Sutton Coldfield and green for Solihull and Airport) and points of additional information as a blue circle with white 'i'. When you click on a point or rectangle, if you don't see the information you were expecting, scroll through the pages using the left and right arrows at the top of the pop up box. Open map in new browser tab. You can also download all the detailed pdf maps and notes about the routes at the bottom of this page in the 'Related' section. What will happen to your responses? Your responses will be used solely for this consultation and will be kept confidential. Any comments used will be kept anonymous and individuals will not be identified. Your personal data will be held by Birmingham City Council and West Midlands Combined Authority. Personal data will not be shared with any other organisation. This survey is being conducted in accordance with the Data Protection Act 1998 and General Data Protection Regulations (GDPR) and if you would like to know more about our Data Protection Policy please visit www.birmingham.gov.uk/privacy. By filling out the survey you are giving permission for Birmingham City Council to use the data for the purposes outlined above. The public consultation for Sprint has now closed. The next stage involves consolidating and analysing all the feedback we have received and these findings will be shared in the coming weeks. Although public consultation has closed, we are committed to continuing to engage with all interested parties, so, if you have any questions about Sprint or any of the proposed routes, please feel free to contact us.